Though transmission fluid is durable, it’s not indestructible. Regardless of the quality of your transmission or the quality of your transmission fluid, your fluid will, at some point, lose its efficacy. When this happens, your vehicle won’t perform at quite the same level as it once did. How will you know when your transmission fluid needs to be replaced? By keeping your eyes, ears, and nostrils open for specific signs. Wondering what these signs are? You’re in the right place. Here are signs that you require a transmission flush in Lombard, Illinois. A sure sign that your transmission fluid has passed its expiration date is if it’s scorched and charred. Over time, as transmission fluid is used in repetition, it becomes burnt, wearing down and eventually failing to lubricate your transmission adequately. Failure to change burnt fluid will result in your transmission running inefficiently and inconsistently. If burnt fluid is allowed to remain for a long enough period, your transmission can actually suffer irreparable harm. After it’s been overused, transmission fluid will not only possess a scorched appearance, it will also possess a scaling aroma. You will quite literally be able to smell that something is wrong with your transmission. It should be noted, of course, that burning smells can come from other parts of your car. However, regardless of where the smell is coming from, it’s an indication that something is not right. Make sure a mechanic checks it out as soon as possible. If you drive a car with an automatic clutch, it should shift gears fairly seamlessly. As you increase speed, your car should go from gear to gear without any noticeable hesitation. If your car is hesitating when shifting gears, your transmission fluid is likely not doing its job. Transmission fluid is used to lubricate your transmission. 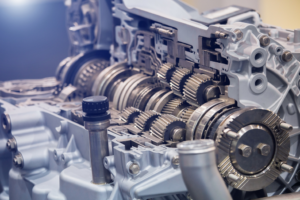 If your transmission is not properly lubricated, your gears will grind against each other, working less efficiently than they should be working. When something is wrong with your transmission, it can make a wide range of noises. These noises include everything from whines, to gurgles, to grinds, and more. If your transmission is whining or grinding, it has likely suffered a mechanical impairment. If your transmission is making a gurgling noise, it is likely low on transmission fluid. In either case, it’s wise to have your transmission checked by a professional mechanic. He or she will be able to determine what the exact problem is, and then make any necessary repairs. It’s simple: your transmission fluid should never, under any circumstances, be leaking out of your car. If your transmission fluid is leaking, your transmission has suffered physical trauma of some type, and is punctured in one or more areas. How will you know if the leaking fluid is, indeed, transmission fluid? If it’s transmission fluid, it will possess a light red color. In your fluid is old and worn down, it might have a more brown or black appearance. Should your transmission have a leak, it will require much more than just a flush. In some cases, it will require repairs. In other cases, your transmission will need to be replaced entirely. Looking for a Transmission Flush in Lombard, Illinois? Have you noticed any of the above-described signs? Looking for a transmission flush in Lombard, Illinois? If so, we here at King Transmission Company are the people to see. Our team of seasoned auto mechanics is well-versed in the maintenance and repair of all types of transmissions. Regardless of the make and model of your automobile, we can accommodate you.